Band-Aid Brand Adhesive Bandages for kids, featuring Nickelodeon Teenage Mutant Ninja Turtles designs, cover and protect minor cuts and scrapes with fun Teenage Mutant Ninja Turtles graphics. 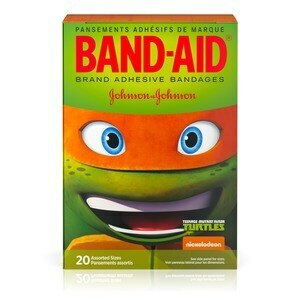 These sterile bandages come in assorted sizes with designs featuring the Teenage Mutant Ninja Turtles. Band-Aid Brand Adhesive Bandages stick to the skin, not the wound. This package contains 20 sterile bandages in assorted sizes suitable for small wounds. Sterile unless individual wrapper is opened or damaged. For medical emergencies seek professional help. Caution: the packaging of this product contains natural rubber latex, which may cause allergic reactions.